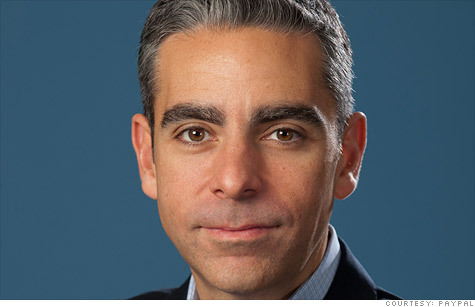 PayPal's new CEO, David Marcus, joined the company when it acquired his startup, Zong. NEW YORK (CNNMoney) -- PayPal is throwing its full weight into the mobile payments market. To fill its vacant top spot, the Web payments giant is elevating David Marcus, who joined the company in August as its mobile chief. EBay (EBAY, Fortune 500) said Thursday that Marcus, the former CEO of mobile payments technology developer Zong, will become the new president of its PayPal subsidiary. He takes the role left open by former PayPal president Scott Thompson, who departed in January to become Yahoo's new CEO. Marcus joined PayPal last year when it shelled out $240 million in cash to acquire his company. Founded in 2008, Zong lets users pay by smartphone for virtual goods. It's a payments providers for Facebook's digital currency, Facebook Credits. Before launching Zong, Marcus started two previous companies: alternative carrier company GTN telecom, which was acquired by World Access, and Echovox, which helped media companies connect with audiences through mobile devices. "He's going to lead PayPal with that 'founder's perspective,'" eBay CEO John Donahoe wrote Thursday on PayPal's blog. PayPal is at a critical point: It wants to expand its Web dominance into the fast-growing mobile payments realm. The company is on track to process $7 billion in mobile payments this year. That's 10 times its mobile volume just two years ago, when it handled $750 million. In one of its latest maneuvers, it launched PayPal Here, a direct competitor to much-buzzed-about payments upstart Square. But PayPal is just one of many players looking to crack the mobile payment space. Everyone from carriers like Verizon Wireless and AT&T (T, Fortune 500) to banking giants like Visa (V, Fortune 500), Bank of America (BAC, Fortune 500) and JPMorgan Chase (JPM, Fortune 500) have been trying out mobile payments solutions. 0:00 / 3:52 Is this the future of mobile payments? In July, Google its mobile and web based payment system, Google Wallet, which allows users to make purchases through their smartphones. A host of startups are also making waves, including Venmo, which lets users to send money to each other through text messages, and Square, which targets the small business market. PayPal hopes to head off some of the competition by partnering widely with app developers. Those alliances stretch from big companies like Starbucks, which uses PayPal to power its pay-by-phone app, to small startups such as Tabbed Out, which taps into merchants' point-of-sale systems and lets users close out their bar tabs on their phones. One of PayPal's partners, Bump, launched a new app on Thursday called Bump Pay, which lets users bump phones to transfer money using PayPal. That technology was previously embedded in Bump's app, but the company decided it worked better as a standalone app. "What we did with our app, and what a lot of apps are doing, are trying to boil things down to their essence," Bump CEO David Lieb told CNNMoney.